For a free estimate, any questions you may have or would like to schedule an installation, call us or use this page to contact us. We will have someone get back with you as soon as possible. Remember, we custom fabricate on site to your homes exact measurements for a perfect fit and proper drainage, so if a field employee is needed to respond to your request it may take a day or two. Please provide the following information, as well as the scope of gutter work you want us to look at / include on your bid (Is this for new construction, replacing all or just some of the gutters, repair to a damaged gutter). Also, is this work to be on your house, an out-building, detached garage, pole building, etc. Bids are usually done within a day to a week. 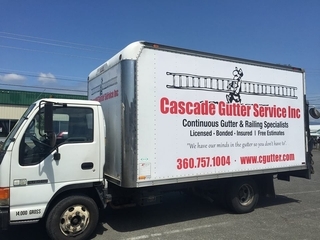 We look forward to working with you and the opportunity to provide you with the highest quality material and expert installation crew for your gutter needs. from moisture penetration and structural damage.